This innovative material combines the strength of wood and the easy maintenance of vinyl. For a long product lifecycle, we made Fibrex twice as stable and rigid as vinyl. The stronger, thinner frame provides a wider glass area for an unobstructed view. It is also strongly resistant to mold and rot due to a special polymer formulation that surrounds and coats each individual wood fiber. Our products, including double-hung, picture, and casement windows in St. Charles, MO, all feature Fibrex. We guarantee that it will not rot, fade, flake, and blister, so you can save on repair and maintenance. It will also remain stable against extreme temperature changes. 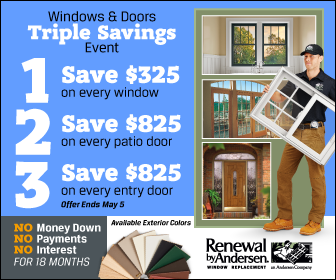 When it comes to St. Charles, Missouri, energy efficient windows, trust Renewal by Andersen. Our windows have exceptional insulating properties. Along with that, the rate of expansion and contraction of our Fibrex material is low, unlike traditional vinyl. Fibrex windows are more energy-efficient than other materials because they will not crack, bow, or warp in shifting temperatures. This results in the prevention of air and water leakage. Our st andard models also use High-Performance™ Low-E4® glass. Compared with dual pane glass, it is 56% more energy-efficient in summer and 45% more energy-efficient in winter. It also blocks damaging UV rays to protect your furnishings. Fibrex windows can enhance your home’s curb appeal. The color coating requires minimal maintenance, so it will stay vibrant for years. Their slim and attractive profiles lead to better views and more sunlight. All windows are custom-made, so you can get the exact size and shape you want. In addition, you can choose from 27 different color combinations, including stainable wood interiors, to match your home. Renewal by Andersen® of St. Louis, your trusted professional in windows installation in St. Charles, MO, can also help you with design ideas. At, Renewal by Andersen of St. Louis, we ensure customer satisfaction. To learn more about our innovative Fibrex material, call us at (314) 332-2364.